I explained in the last review that I had hoped that this issue would conclude this part of the story and move on to deal with the first expansion. Clearly that's not going to happen. As of now, this is a seven issue limited series and will most likely follow a single narrative. Luthor begins leading his impromptu team of metahuman human survivors against Brainiac. The team includes Doctor Fate, Blue Beetle, Black Canary, The Atom, Power Girl, Solomon Grundy, Mr. Freeze and August General. Lex explains how Brainiac will continue his process of stealing meta-gene powers from existing heroes and villains while bottling up important cultural landmarks and data about Earth. Then the rest of life on the planet will be deleted. Blue Beetle wonders why they aren't being led by Superman and wonders why he hasn't returned from the Sun. Luthor decides not to tell any of them about how he killed Superman with his Kryptonite Spear back at the beginning of the last issue. Mr. Freeze and Doctor Fate turn on Lex and claim that he isn't fit to lead this group, but August General stands up and claims that if he is to follow anyone's orders in this situation, good or bad, it will have to be the smartest person in the room. Atom, being the second smartest present, looks to Lex with a sigh and asks what his plan is. 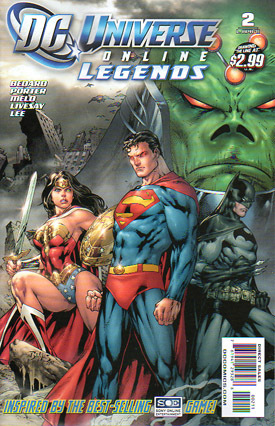 With Luthor leading from his secret base, the team separates into three groups. August General, Blue Beetle and Black Canary head to Metropolis to take a quantum scan of Brainiac's mothership. Mr. Freeze and Doctor Fate go to Keystone City in order to collect sample of the exobyte technology. Atom, Cheetah and Solomon Grundy return to Luthor's Rocky Mountain facility, but are surprised that it's guarded by the robots Lex created for Brainiac. Cheetah suggests to Grundy that the robots want to hurt her and that he should hurt them first, and fortunately he forgets that he hates cats and obliges. At this point, Power Girl disappears from the story. Perhaps that will be explained in the next issue. Flashback to the present day, seven years earlier. Luthor oversees the prototype production of Brainiac's initial robot designs at his Rocky Mountain facility. He stops to speak to Brainiac who tells him he intends to sample human genetics as a control for his exobyte experiments by stealing an office building full of people. Despite Luthor's demands that Brainiac leave his city alone, several car-sized machines plummet out of the sky in Metropolis and impact sequentially in the sidewalk around the Daily Planet Building. On the roof of the Planet, Jimmy Olsen points out to Perry White and Lois Lane that these "meteors" form a perfect circle around the structure, so they either dodged a bullet of chance, or they just became a bullseye. Perry turns around for Clark Kent, but he has already taken off as Superman and contacts the Justice League of America about the situation, all of whom immediately answer the call and head to Metropolis. Using his impacted anchor pods and a small ship at the top of the Daily Planet, Brainiac creates an enormous force field that none of the Justice League can penetrate, including Superman. The people in the building begin to collapse as gas is released inside, but Batman assures everyone that they're just passing out and not dying before their eyes. Superman recognizes the ship as Brainiac's as it lifts the building off its foundation and flies quickly toward the sky and into space. Superman follows but can't seem to catch it until it hyper-jumps out of his range entirely. Still communicating with Brainiac, Luthor warns that if he harms Lois Lane that their partnership will be over and not to test him. Back to the future again, Solomon Grundy finishes off more of the robots while Atom and Cheetah break into the facility. Black Canary reports back to Luthor that her scan of Brainiac's mothership is complete and Mr. Freeze explains that he and Doctor Fate have collected enough samples of the exobytes. Luthor replies that once they have all returned, they will begin their assault on Brainiac. He thinks to himself that they still don't have much hope of defeating Brainiac and saving humanity since he killed Superman, but he can still settle his personal score, even if it costs the lives of himself and his makeshift team. Story - 2: This is a fun story so far and I'm enjoying the intricacies of the flashbacks, especially that the entire Daily Planet building with all its occupants was taken by Brainiac. But there's one major plot point that simply doesn't work. I refuse to believe that Lex Luthor cares so much about Lois Lane that he's willing to put his life on the line to take revenge for her kidnapping and potential death. Luthor's motivations change constantly from one writer to another, so let's agree that this version has a thing for Lois Lane, but he's also willing to do anything it takes to kill Superman and doesn't care who gets hurt in the process. He's a pure sociopath in most continuities and this one is no different. He's incapable of real love and there's no way he would put his life on the line to save Lois, let alone to take revenge for her. He would absolutely put other people's lives up for grabs in order to exact that revenge, but not his own. Like I said, he's a sociopath. Then again, the score Lex is looking to settle just might have little or nothing to do with Lois Lane. The "Next Issue" box claims that #3 will include Luthor's secret. Perhaps I'm misreading the subtext and his personal score has to do with the scarring on his face and the loss of his eye. And where did Power Girl go? I expect she'll return in the next issue, but why can't this stand on its own as well? She just disappears, and that pulled me out of the story. In fact, she should have had a voice in the first few pages when the team was discussing having Luthor lead the group. The theft of the Daily Planet building was pretty awesome, except for the appearance of the entire Justice League who were only there so they could make an appearance and immediately fail at their jobs. Art - 3: With two different artists working on the future and present parts of the stories, it's hard to nail down an effective rating. The art can get away with being uneven in these circumstances, but both get a "3" this time out. Some scenes simply come off better than others. For instance in the present, Brainiac's attack on the Daily Planet building looks great, but the Justice League response looks artistically weak by comparison. In the future, there's the same problem as before. Close-ups and action scenes look fine, but establishing shots and background characters are weak by comparison. Cover Art - 4: Ed Benes did a great job with this cover. I've been vocal about the overuse of Superman's red eyes when he's angry, as though he's welling up heat vision in anger. But since it was already established in the opening video for the game, plus he should be angry in the present because of the loss of the Daily Planet building, it's acceptable under these circumstance. Batman and Wonder Woman look great too, but why does Brainiac have Voldemort's nose? Cover Art (Digital Edition) - 5: This cover is so simple, yet works so well. Wonder Woman looks amazing. 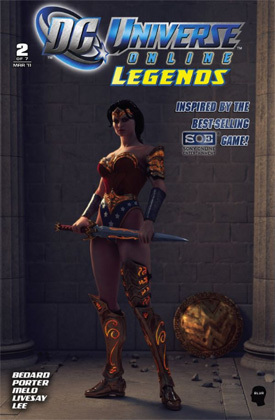 There are a few additions to her costume which were also in the future scene from the opening video to the game and she appears to be in front of the wall of a building on Paradise Island with her shield against it. This is also the first cover to show that this is a limited series. Even the Diamond solicitations failed to explain that. So it looks like we have five issues left.